KEY CONCEPT: Simplifying fractions word problems. DESCRIPTION FROM THE PUBLISHER: When a valuable fraction goes missing, George Cornelius Factor (a.k.a. GCF) vows to track it down. Knowing that the villainous Dr. Brok likes to disguise his ill-begotten fractions, GCF invents a Reducer a tool that strips away the disguise, reducing the fraction and revealing its true form. 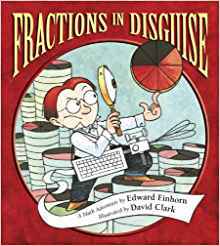 Equal parts of action and humour add up to a wholly entertaining introduction to simplifying fractions.